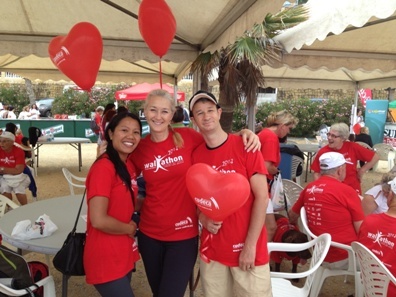 Recently staff members from IPIN Global took part in the Cudeca Walkathon held annually in Benalmadena. The walk is in different stages depending on ability and is a maximum of 10km (with no running allowed!). The idea is to raise awareness of the work that Cudeca carry out in the province and to of course raise funds to enable them to continue with their work. This is a cause supported by Antonio Banderas and although he wasn't there on the day he had passed on a message to be read out on the day by the organisers to rally the walkers. On the day participants and spectators gather on the beach and play games, enjoy the BBQ and Paella, listen to live music and purchase raffle tickets (sadly our staff didn't win anything this year). Red heart balloons were sold to be released in memory of a loved one lost to cancer or someone still fighting the battle. This year the sum raised was over 22,500 EUR of which IPIN Global raised 480 Euro in sponsorship. Cicilia Thomas, Tracie Buckman and Wesly Jay and their family and friends enjoyed the day although the weather had turned a bit blustery and overcast. Cudeca offer support as a hospice to make those final days as peaceful as possible and their premises are a haven away from hospital wards. Their manicured gardens are a little oasis for families when they need peace, quiet and some space for a few minutes during a difficult time or after the passing of their loved one it's a place to reflect. They also offer massage facilities, hairdressers and lots of healing therapies, anything to help make the disease a little easier to bear. Although their main role is to assist the patient they also support the family and can even counsel the bereaved, all in all an amazing cause and we will continue to support them here at IPIN Global.